This is a private tour with a taxi and guide. With a local driver and a licensed tour guide, your travel experience in the Nikko area will be an easy task. At 8am, your taxi will come to pick you up from your hotel in Yokohama and head to the Nikko area. Your first stop will be at the famous Nikko Toshogu Shrine, the UNESCO World Heritage Site that is famous for its lavish decorations, ornate details, and five structures categorized as National Treasures of Japan, and an additional three categorized as Important Cultural Properties. This 400 year old shrine houses the remains of the Edo period's founder, Ieyasu Tokugawa. You will enjoy seeing the traditional beauty of the main hall, as well as the sleeping cat and 3 monkey carvings: Speak no evil, hear no evil, see no evil. Please note: Yomeimon Gate may be obscured due to repair activity. After about an hour at the Nikko Toshogu Shrine, you will move to the Kegon Falls which is known as one of Japan's 3 great waterfalls. The Kegon Falls towers an impressive 97 meters and gushes water from Lake Chuzenji which was created by an eruption of Mt. Nantai, this lake is a symbol of Nikko. Then you will move for a short visit to the Senjogahara observatory in Nikko, one of the nation’s most renowned marshland areas. You can enjoy a variety of nature trails, 350 kinds of wild plants, and many species of wild birds. The trails offer magnificent views of the marshland with Mt. Nantai in the background, and an array of natural panoramas. 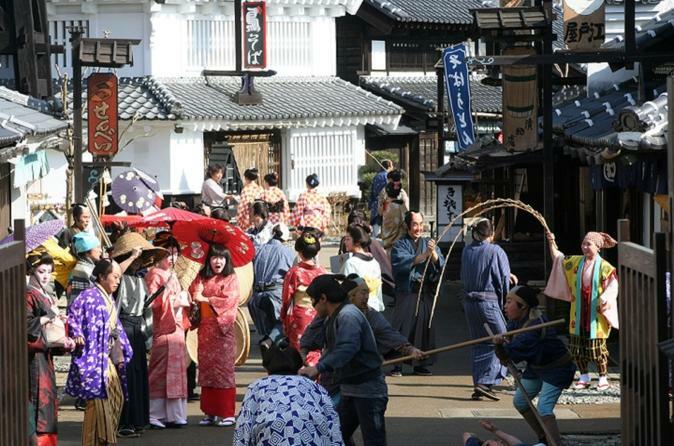 For about an hour and a half after Senjogara, you will enjoy seeing special Oiran shows (similar to geisha), ninja shows, and a replica of an old Edo town at Edo Wonderland. There are so many things to experience at Edo Wonderland, not just sightseeing but a chance to really get to know the Edo period up close. After your long day, you will depart the Nikko Area and return to your hotel in Yokohama by taxi by 7 or 8pm..